Kasisto’s Kai (branded as KAI) platform is licenced by financial institutions worldwide to power chatbot and virtual assistant interfaces. Now it will be a strategic vendor for TD, providing it with the backend technology that will make it possible for TD to deliver personalized and contextual services to its customers. The first way TD will do so is through its mobile app, with an AI-driven chatbot. App users will be able to check their balance, review transactions, monitor spending, and get answers on questions about their spending habits. 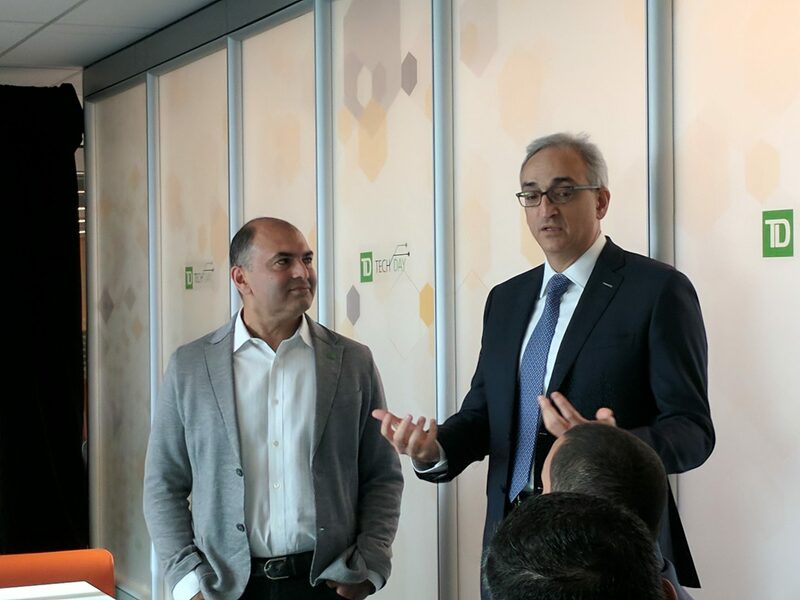 TD Bank’s chief digital officer Rizwan Khalfan (left) and Kasisto CEO Zor Gorelov. This isn’t TD Bank’s first chatbot. In June, it launched a chatbot to Twitter to provide help on general inquiries such as how to report a lost or stolen card. But that chatbot doesn’t take into consideration the customer’s identity, whereas Kai will do so through TD’s mobile app. Not only does Kasisto provide AI capable of a conversational interface, but it also uses context to help users solve their problems, says Zor Gorelov, CEO and co-founder at Kasisto. The platform can deliver natural language processing in English, French, and many other languages. “Think of it as a brain that can be connected with the rest of the banking infrastructure and have conversations with its customers,” he says. TD has 11 million customers that are active on its digital channels daily, according to the bank. It is looking for ways to boost engagement with those customers on the mobile platform. Khalfan points to a Sept. 14 report from San Francisco-based App Annie, ranking it first against its competitors in terms of active monthly users. App Annie report placing TD as top-ranked mobile banking app in Canada in terms of monthly active users. Beyond the mobile app, Khalfan says that Kai’s AI platform could be delivered to other virtual assistants. The mobile app capabilities are planned for release in the first half of 2018, and Khalfan says that experiences via smart assistants are “months, not years” away.